We’ve been super busy here and I’ll take responsibility for the slow pace of blog posts. That said, it’s not an indication that the actual game development work has slowed down. In the last post, we updated you all on where we’re at with Panzer Campaigns. There was a very positive response from the community and many suggestions on areas to focus or upgrade. Be assured work continues apace on that series. 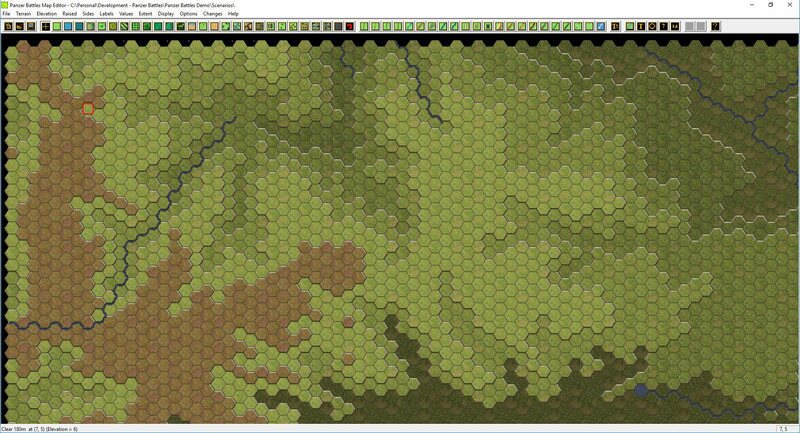 This post and the next, will give you an overall look at the work currently underway on Panzer Battles. The release of the Demo has gone exceptionally well and the number of downloads has exceeded our expectations. 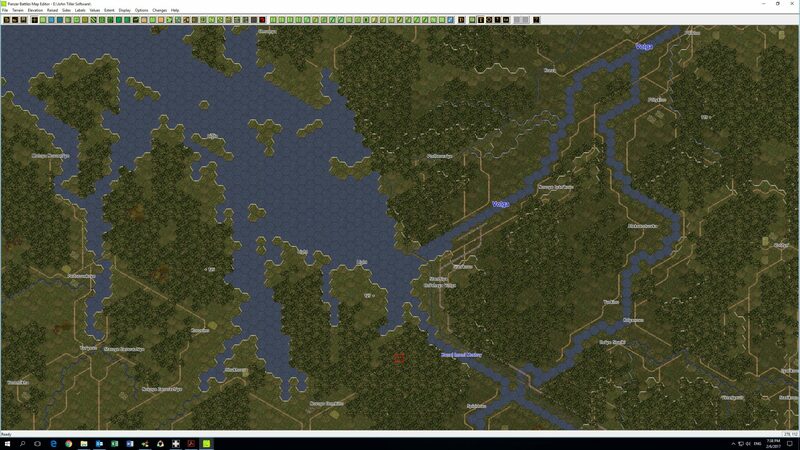 There has also been a definite increase in the purchase of the first two released title, Kursk and Normandy after people have tried the Demo. We have also received feedback on things people like and dislike. Some are related to the user interface; others are with game features or wish-lists of battles to be covered. All in all, the Demo has achieved what we hoped for. For the first of these; enhancing the Game System, we have found feedback from our testing teams and the community invaluable. For example, in the wake of the Demo release people mentioned that the Icon set was ‘too green’. The colours do represent ‘like’ function and there was logic for the attribution, but it was not a big change to further segment the range of colours. 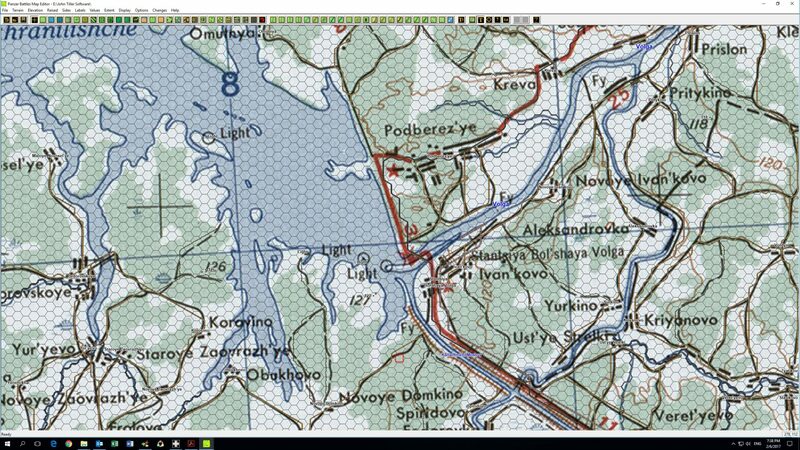 From Panzer Battles 3 and subsequently when we patch all other titles we will include a new icon toolbar. Below you can see what has changed. The top graphic are the current icons set and below are the proposed new ones. The Green icons have been broken into three groups. Tan is for ‘shade commands’ such as movement, command and weapon ranges. Khaki is for unit and other highlight commands. Green is for all others, usually map and other miscellaneous functions. Stemming from many of these debates, we realised that we didn’t exactly understand how each of the in-game values worked. The included manuals usually hint at impacts but rarely lay out the actual calculations. Berto our programmer decided that we need to have a way to understand some of the calculations in the code, ideally where the development team could follow rather than require a programmer to explain it each time. 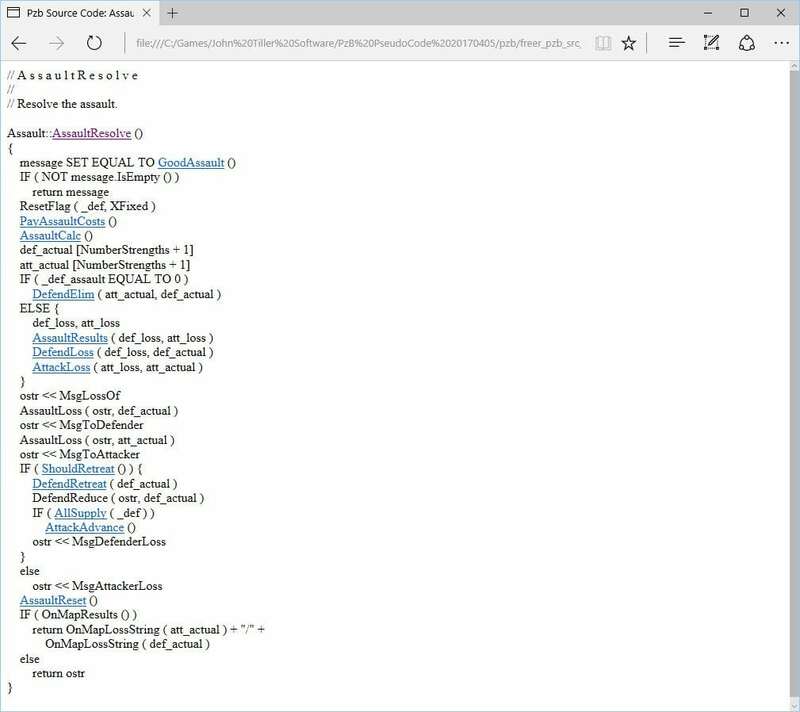 Having this Pseudo code has allowed the development team to understand more about what the code does in various situations and more importantly what factors come into play in each calculation. It makes it much easier to understand the interaction of all the games components and items such as unit values and the interplay with parameter data values makes much more sense. The pseudo code is an example of the new development toolsets we now have available. Mike Avanzini has also been hard at work standardising the actual in game data. Originally when creating the Demo, we expected to pick up components from released titles and build a few new scenarios. It quickly became evident that the breadth of period covered in the Demo would require us to standardise many of our naming conventions as there was impacts with artwork, reporting and even covering multiple geographic theatres. 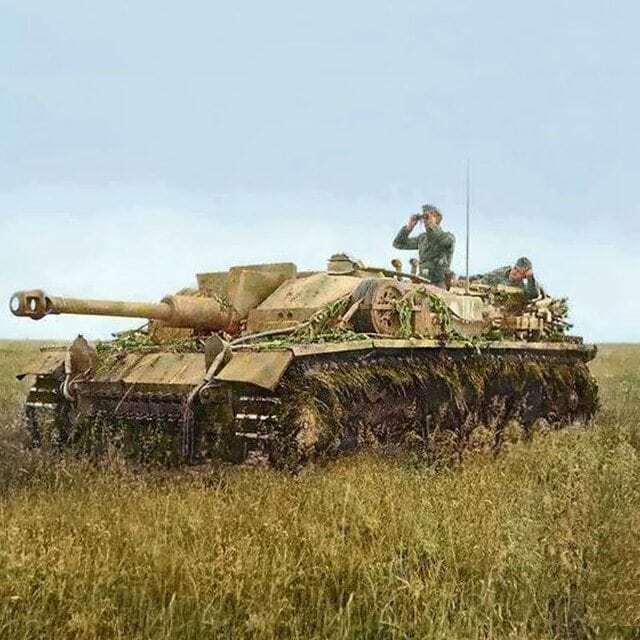 For example, the Germans fought on the Eastern & Western Fronts as well as the Desert from 1939 through 1945; in many cases, simultaneously with different load outs and squad and platoon layouts. 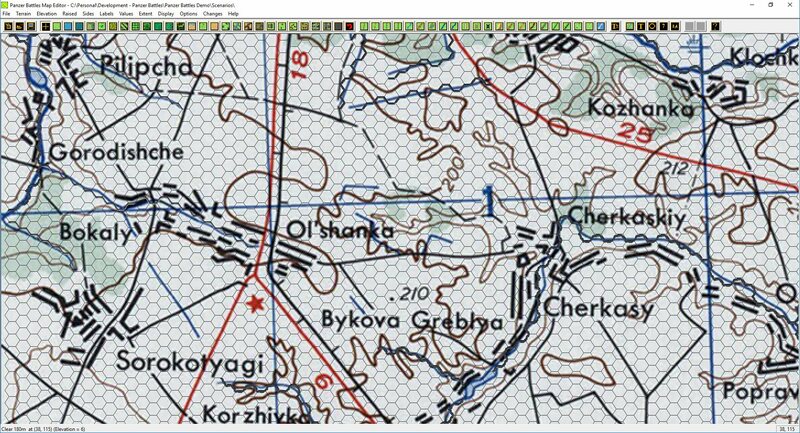 Covering the amount of variations was impossible with the force structures setup in Kursk and Normandy. The Demo meant we had to go back to the beginning and define how to cover off all nationalities for the period of the war. 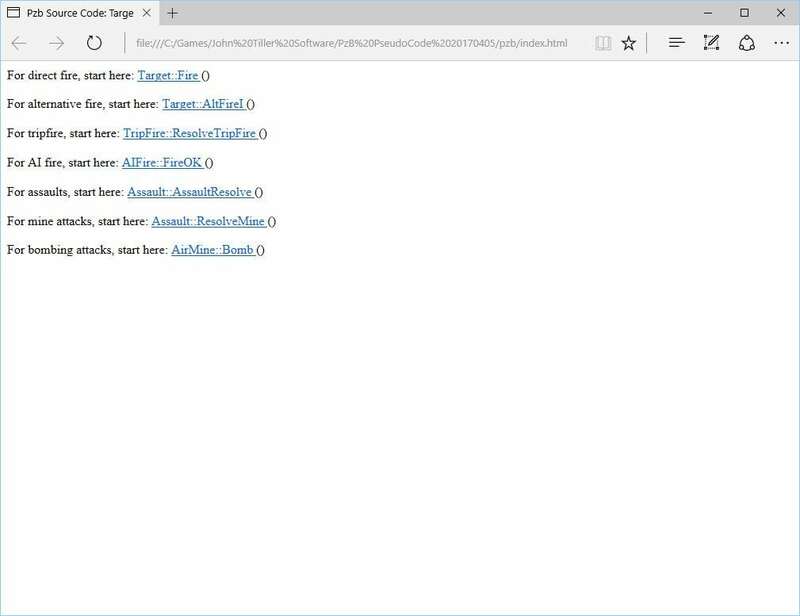 Mike spent a month, building out possible reporting structures and once reviewed rolled it out for the Demo. Here is an example of the layout for a Soviet regular and Guard unit. 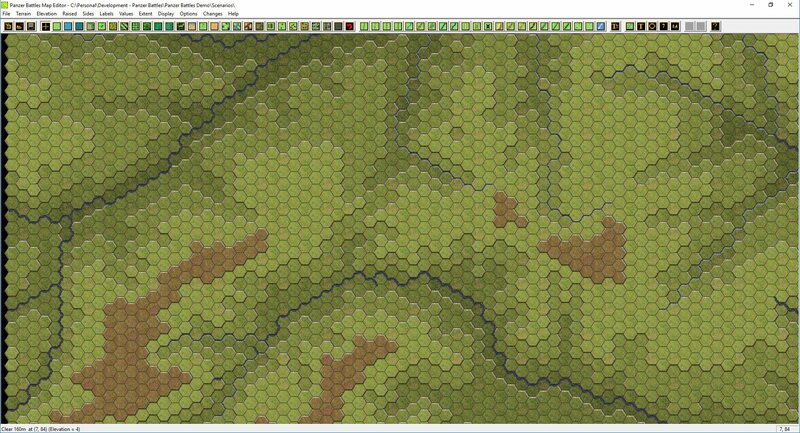 The main reason for going down this path is that we can now build standard templates of formations within the Order of Battle editor and hand them out to our scenario designers. Additionally, all the artwork will not have to be renamed with each new release but can be included with each template. This approach is saving us a huge amount of time setting up new titles and scenarios. Mike has now created several orders of battle and has now moved across to map making as that requires as much effort as the orders of battle. 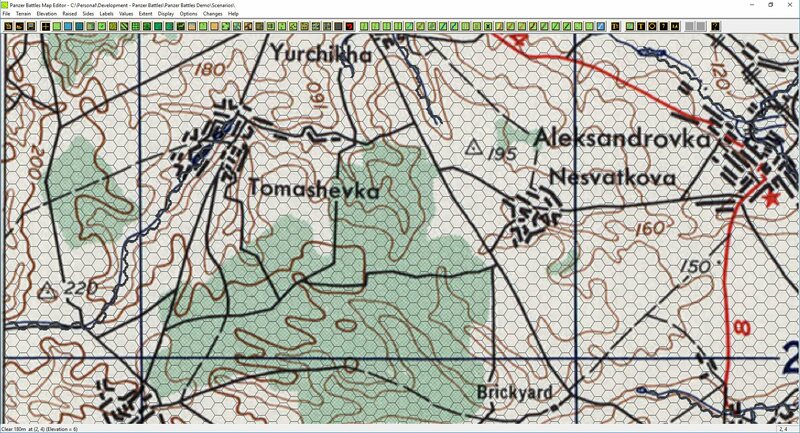 Mike has spent the bulk of his time working on Russian maps. This is not an indication of our preferred next title(s) but rather another resource we can hand out to our scenarios designers to work on immediately. Their work will ultimately end up either in the Demo or as full titles. Following are maps from four different campaigns in various states of completion. Can you work out what operations we’re planning to cover? The maps are shown in order with the map source first and then the current state of the in-game map following. All images are at the medium zoom level. We’ve covered a lot in this post, showing some of the behind the scenes work that is going on. The next post will cover off the state of Panzer Battles 3, highlighting the work done to date and what’s left to do. 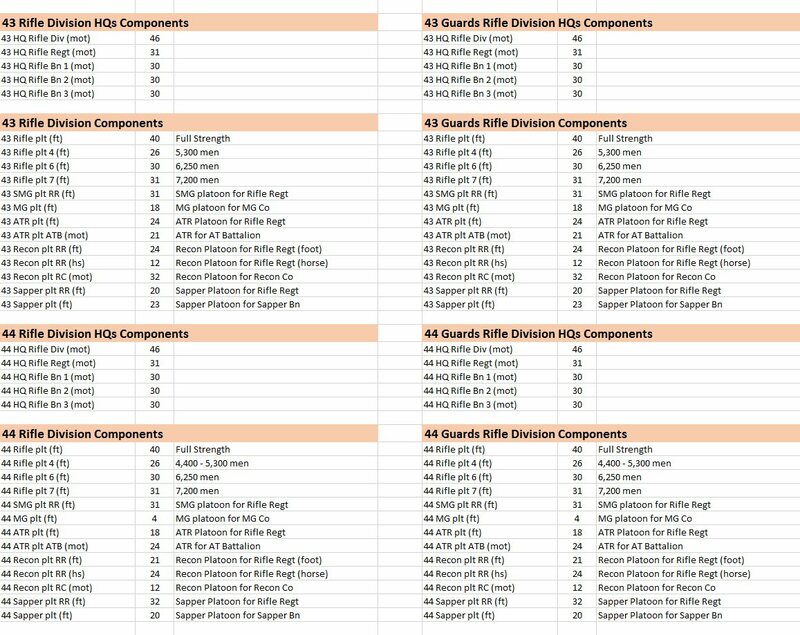 The supply system with HQ’s is very hard to figure out, It would be nice to have an option not to use the supply system at all. Not sure I like removing the SS/Guards designations. They seem to add immersion to the scenarios? Also not many comments yet. Are the Blitz guys aware that there are updates here. Usually Xaver or ComradeP have thoughts. I hope you will consider putting in another closer zoom level or two. Many games now allow the player to zoom in close to get a good look at the units etc. It’s one of my problems with your games which i am a big fan off. I agree with Mr. Sarnoff. The unit box in the lower left that we right click on to see “hard/soft” data is almost unreadable. This should have either larger font or a zoom level when you right click on it. I have a hard time believing that no one in the design staff has noticed this. You do realise if you have Windows 10 that you can have a higher default zoom level under ‘Display Settings’? This is useful if you want the base level at a higher zoom. That is often not a good option. Better to have it built in and yes there is a magnifier as well, another poor option. that would be nice……….BUT……….I have windows 7.
do you have a solution for windows 7? I most strongly agree with Messrs Matthews and Sarnoff. I included a similar comment/recommendation in the recent survey, and would like to reinforce the notion here. 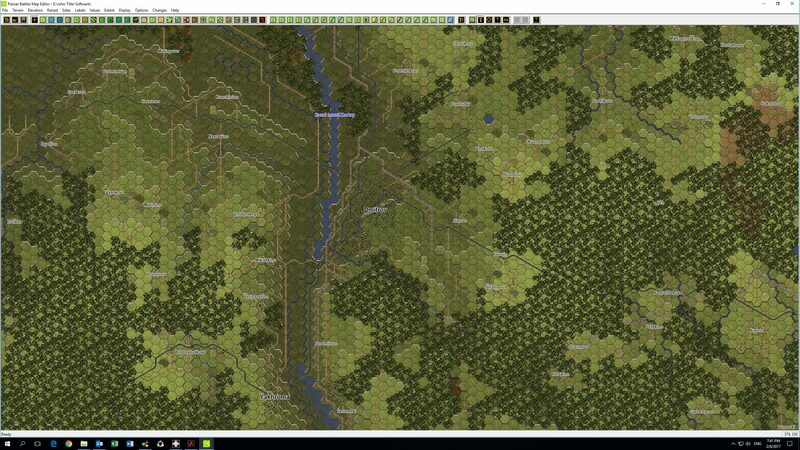 A redefinition of the screen dimensions of the units/terrain box would be MOST helpful. I’m also a Windows 10 (running on a Bootcamp partition in MacOS) user, and have tried a variety of unsatisfactory workarounds. I’ve settled on the Windows “magnifier,” but that’s quite clumsy and time-consuming. It seems least disorienting to toggle the lens version on and off, since I only really need it for the units box, and occasionally to look at some terrain features. Dropping my screen resolution also works, with the expected shortcomings. I play on my laptop, a 13-inch MacBook Pro, and the terrain and unit details are hopelessly microscopic. If I play near my desk at home, I can port the screen output to a 27-inch TV and that works quite satisfactorily (if a little disorienting using a trackball), which makes me wonder if most of the developers aren’t…developing… on systems with screens much larger than the typical home desk or laptop system. 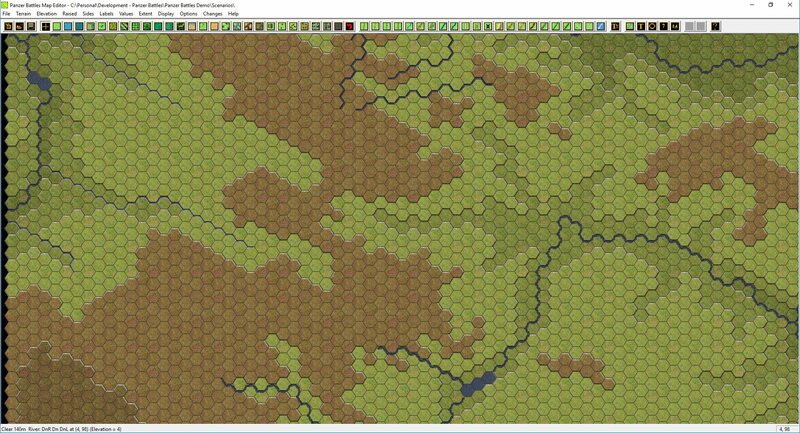 Anyway, I second/third the request for better visibility of the units/terrain box. Otherwise, LOVE the games! I find it hard to believe that the developers never noticed that it’s difficult to read that info in the unit description. I also am discouraged that the developers response to our critique of this function is a windows solution that does not work. This function should be part of the game. I hope that the developers take a hard look at this problem. The core users of the “Gold” system are older and their eyesight may not be as good as the young guys who developed the program. At the very least, take a hard look at font size and background colors to improve the quality of the information displayed. It reflects poorly on the design staff if all this time and effort to update the games and then say, basically “it’s not a problem”. I appreciate your comments and your dilemma. I am also satisfied if you are at the very least are thinking about this issue and responding. As a buyer of these games and an avid player, I must say it does aggravate me that I cannot read that info. As someone else stated, they have come up with work arounds, as have I. My work around has been a physical one. I bolted a magnifying glass, mounted to a stand, with an articulating viewing glass to my work bench. Sounds complicated……….but not really. With this device I can view the info.